As the years pass, you discover seedlings that grab your attention for one reason or another. Perhaps one stands out as very different from its siblings, or one might have an architecture feature you like, or superior disease resistance. While it might not be immediately apparent what purpose such a seedling might serve, it is wise to hang on to it and culture it and wait for its purpose to be revealed. I know that sounds a bit too mystical to be appropriate for something as systematic and planned as rose hybridizing, but the concept has meaning. Take 42-03-02 illustrated here, for example. It is a selfing of the Moore breeder 0-47-19. It bears a striking resemblance to the Moore Hybrid Wichurana except that it has deeper coloring and is a 2.5 foot rounded shrub, always in flower. As its parent is a known diploid, I am assuming this is also and so I now use it in breeding specifically to further diploid breeding lines. It accepts a wide range of pollens and makes seed with about 50% viability in most cases. Testing the limits of its ability this year, I put some strikingly dissimilar pollens on it, including a 'Schneezwerg' F2 seedling and 'Scabrosa'. I have also used my R. foliolosa on it, and all of these pollens have resulted in healthy, fat hips. My recommendation to breeders is that when a seedling grabs your attention for some reason, pay attention. It might prove to be a stepping stone at some point down the line, It might not tell you what its purpose is today, but it might turn out to be meaningful in a few years time and you'll be glad you kept it. With the advances in genetic testing and DNA sequencing, it has become possible to perform tests on historic roses to determine the facts about their ancestry in ways we never could before. Case in point: the Damask roses. In 2000, an article was published in Gene magazine in which the researchers studied the genes of key Damask varieties to determine which species contributed to their creation. "Damask roses are one group of old rose varieties and a key material in old European rose improvement in the 19th century. 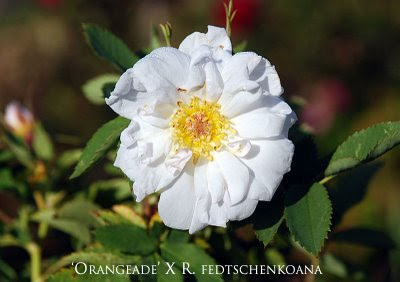 To clarify the origin of Damask roses, we selected four varieties as the oldest Damask varieties and examined the relationship between the Damask varieties and their putative ancestors at the molecular level. Randomly amplified polymorphic DNA analysis of the Damask varieties proved that they had an identical profile, indicating they were established from a common ancestor. They have never been allowed to reproduce sexually; their reproduction depends entirely on vegetative propagation. 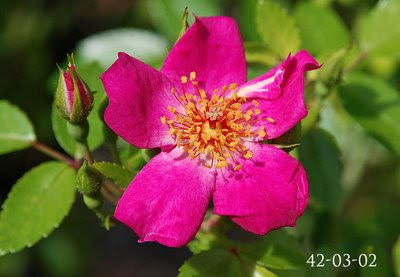 We identified three Rosa species, R. moschata, R. gallica and R. fedschenkoana, as parental species of the original hybridization that contributed to forming the four oldest Damask varieties by sequencing the internal transcribed spacer of ribosomal DNA. We also found that all the four oldest Damask varieties had chloroplasts derived only from R. moschata, as judged from psbA-trnH spacer sequences. This triparental origin of the four oldest Damask varieties can explain some morphological characteristics of the four oldest Damask varieties, like fruit shape, leaf color and the 'Moss' character." A few years ago Kim Rupert sent me cuttings of one of his R. fedtschenkoana hybrids, where 'Orangeade' was the seed parent. The plant illustrated above is that hybrid. This is, in a sense, a primitive Damask and may have value as a source of some of the same genes that make the ancient Damasks such valuable shrubs. I am currently using this Rupert hybrid in breeding and it appears to be fully fertile as a pollen parent, and although it has never set seeds for me, Kim tells me it does so in his desert climate. Since both seed and pollen parent are tetraploids, I am assuming this hybrid is as well and I will proceed on that assumption. The Rupert hybrid is a tall arching shrub with bluish-green foliage and loads of small (1.25") white blooms, about 15 petals per bloom. It is a freely suckering plant and extremely healthy in my climate. The blooms don't always open properly, which I think is a response to our weather cycles in the early Summer. The blooms have a very odd Musky-soapy scent that many people would find unappealing. I will soon post a photo of one of this year's seedlings derived from this R. fedtschenkoana hybrid. 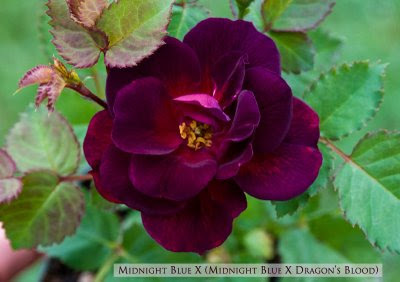 Occasionally, if you are very lucky, you will find mutations called "sports" among your roses. 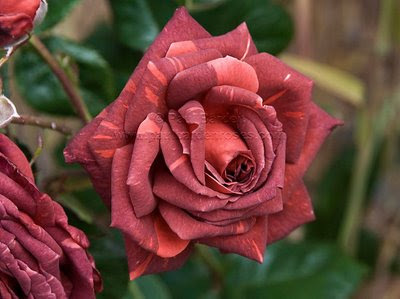 What you see here is a striped sport of E. B. LeGrice's 'Jocelyn', one of his "brown" Floribundas. I have had this for a couple of years now, and I'd have distributed it by now except that it has proven difficult to propagate. I'm trying some different techniques now to see if I can get some plants started. Curious, eh wot? Here is a new photo of my possible R. omeiensis hybrid. I don't really understand how this happened, but it suggests that R. foliolosa is a bit of a trickster, capable of producing offspring that look similar to 'Basye's Purple' when crossed with a variety of other roses. It may be important to note that 'Little Chief' is almost certainly a diploid, and it is highly likely that this "R. foliolosa" is also. The thing to do now would be to grow a population of open pollinated seeds from the "R. foliolosa" I have and see what the offspring look like. I suspect there will be noticeable variation and a percentage will look like this. I have sent out some seeds from my "R. foliolosa" and so perhaps the recipients will be able to report their results. PS: it is of interest to me that this purple seedling appears to be fertile as both seed and pollen parent and I will be working with it more, now that I know that. If anyone wants to try pollen from it, I am willing to share it. Comment to request it. Several years ago I purchased a group of R. omeiensis from Lawyer Nursery in Montana. Their description and title of the plant was somewhat vague but it led me to believe these might be a form of R. sericea ptericantha, with its wide, bright red wing-like thorns. As these made some new growth it became apparent that these were not what I had hoped, but some variation on R. sericea that, for the most part, had very few thorns and the ones it did have were usually greenish in hue and not very prominent. 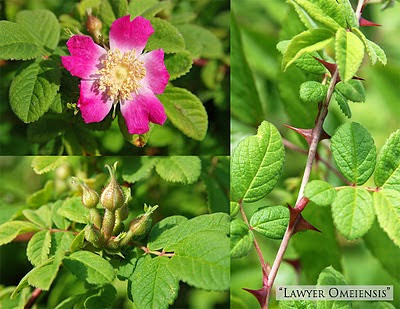 The thorns you see in the photo are rare on these plants, and only this dark pink one makes reddish thorns; the other only greyish green. I gave most of these away and discarded what remained. However, two individuals stood out among the group as being quite distinct. Both of these had denser foliage with more rounded, larger leaflets that were quite downy when young. Blooms come in clusters of three to a dozen at the axils along the canes and are pink with a white eye. Take a look at the shape of the receptacles in the lower left photo: tubular and elongated! There is a light, pungent musk-like scent to the blooms. Both plants have bluish canes when young and neither has ever set seed to my knowledge. Both are about 8 feet tall now, upright but arching from the top third or so. Neither gets Blackspot or Mildew. I suspect these roses were all seed grown and the two I saved are conspicuously hybrids with something else they were growing in the field. Do any of you recognize any of this rose's features? Does it remind you of any other species? I am pleasantly surprised today to realize that L83 has accepted pollen from 'Stanwell Perpetual' and is making fat hips. Who'd have thought?! This means nothing until they have actually germinated, of course. This is a charming little species, with its one inch cool pink, sweetly scented blooms that start in mid-June and continue on and off through August. It tends to prefer damp locations, and shade, whenever possible. I have a couple of hybrids from last year that are now making sturdy shrubs in the test garden, but none have bloomed yet. The plants of R. pisocarpa here on the farm are mostly thornless, especially towards the outer canopy of the shrub, and it is always graceful with its upright habit that tends to arch horizontally towards the top of the plant. I'm hoping to capture some of its graceful architecture in its offspring, as well as its cluster flowering habit and perfume. All of the literature I have encountered lists this as a diploid, so it might be very useful for anyone wanting to work on a Winter hardy line of diploids. Pollen, as always, available upon request. Rosa foliolosa is such a pretty species, I don't know why I haven't used it in breeding more than I have. I acquired this plant about 10 years ago when someone kindly sent me a few seeds collected from their plant. I don't know how mine measures up against other specimens but it is a very handsome plant and a beautiful flower. 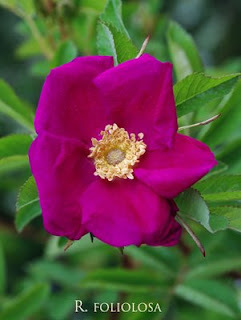 Mine is a very "rugosa rubra" hue of magenta and the flower is large: about 2.5 inches across. It starts to flower fairly late compared to the native R. nutkana and a bit after R. virginiana, and well after R. rugosa. 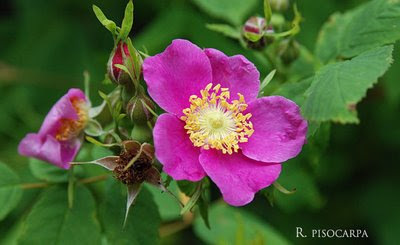 Blooms have an excellent "wild rose" fragrance. R. foliolosa is listed as a diploid and so I am using it in breeding with that fact in mind. If you read the descriptions of R. foliolosa, it is repeatedly stated that this is a low-growing, suckering shrub between 18" and perhaps as much as three feet. It is frequently referred to as thornless as well. Now, my specimen is a non-suckering shrub nearly 6 X 6 feet, with an average number of small, hooked thorns. The bloom color is generally listed as being white to pale/medium pink, where my plant has deep magenta blooms. I have a vague recollection that the person who gave me the seed stated that (for reasons I do not recall) they thought these seeds may be hybrids and not pure R. foliolosa. The fact that my plant deviates significantly from the average description makes me wonder if it isn't in fact a hybrid with something else, probably another species? Who knows. Since I know this is both seed and pollen fertile, the possibility of it being a hybrid makes it potentially even more valuable as a breeder. One thing I can tell you is that years ago I made a cross of my R. foliolosa X 'Little Chief' and the three seedlings I saved all have some degree of remontancy. One of these three looks remarkably like 'Basye's Purple'! (more about that plant soon) And so, I think its high time I put this plant to work in my breeding. Oh, one last thing: I have some seeds collected from this plant that are last year's crop. They are likely still fertile, and I am willing to distribute some of these with other hybridizers who are interested. Comment if you want to try germinating these. The search for yellow in R. bracteata hybrids. Parentage: 'Charles Austin' X 'Out of Yesteryear'. I've mentioned this before: it can be very difficult to get good coloring in seedlings when using 'Out of Yesteryear' as a parent. However, once in a while luck drops something decent in your lap. This seedling is the best yellow I have had from the Bracteata breeding line so far. It may not be the most sophisticated bloom in terms of shape and petal count, but it has a beautiful rich yellow hue and it holds its color for quite a long time. It appears to have excellent resistance to Blackspot, which is a great thing. It has no discernible fragrance though. Its long basal canes break into bloom along most of the upper half of their length, with one to five blooms per lateral. It makes an attractive shrub overall. I'm not sure this has merit as a "finished product" and so I am currently using it solely as a breeder to see if it passes on its color and excellent growth habit to its progeny. I will soon be seeing some of its first offspring bloom, so with luck I will start to get an idea of its potential as a breeder.It does not appear to set seed but its pollen is fertile. It is entirely possible that it is a triploid, as 'Out of Yesteryear' produces both haploid and diploid pollen. On days when I am suffering from hay fever (fortunately these are few, and limited to late May/early June) I shouldn't be allowed to commit anything to writing. I last talked about some seedlings I am using in breeding that came from a cross involving the Indian species R. clinophylla. I also mentioned that although two of my R. clinophylla plants bloomed as juvenile seedlings, their offspring have not shown any inclination to remontancy. That was incorrect. In fact, 92-06-02, sibling to the seedling shown in the June 9th post, blooms on new wood and will repeat on and off a little bit through the growing season. In a warm climate, it is possible that it would bloom through the year. Case in point; the shoot pictured here. (Click to see a full sized version) This shoot, which is now about 18" long, is new wood from the base of the plant, and yet it has terminated in a cluster of bloom. There are several other new basal shoots that are 24" or longer and starting to show flower buds at the tips as well. Now, this is still a young plant and so I can't really say for sure how remontant it is, but this looks promising. I hope this plant in particular is fertile so I can move forward with a diploid line from R. clinophylla. Who knows what kind of tricks this species has up its sleeve, since we know very little about its behavior as a breeder. Note the fine pubescence on the receptacles of the buds. Several years ago Gene Waering distributed seeds of R. clinophylla to several rose collectors, including myself. From my batch of seed I grew about a dozen plants. I gave several away, ultimately keeping only two, which had flowered within 2 months of germination. I thought perhaps these would have some kind of genes for remontancy in them, although my work with these two so far indicates this is not so. Curiously, R. clinophylla has a fragrance often compared to the smell of Acetone, much like its close relative R. bracteata. 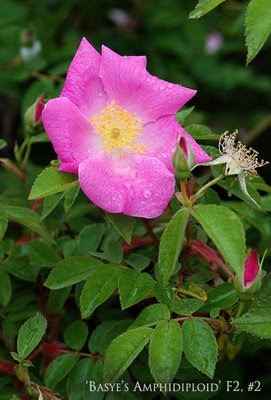 The rose pictured here (click photo to see a full sized version) is one of my first hybrids using my R. clinophylla. This is seedling 92-06-03, bred using a self seedling of Ralph Moore's 0-47-19 I grew years ago called 42-03-02. Back to 92-06-03: this is the most colorful of the three seedlings from this cross to bloom so far. There are four more that have not yet bloomed and they are behaving as though they have genetic problems, so I expect they will be discarded this year. The plant in the photo has long arching canes that bloom along the length of the cane all in one quick flush, with side buds following shortly after. Each bloom lasts 2 days and then drops cleanly. This clone has a slight fragrance. This plant and its two siblings are being used as both seed and pollen parent this year to determine if they have fertility. I am using some old standard diploids with them, such as 'Old Blush' and 'Trier' with the hope that these will allow me to step forward with some remontant, fertile diploids in the next generation. The beautiful ferny glossy foliage on these (especially 92-06-02, which you can read about here) is something I want to retain, but with this ancestry, I suspect these will be evergreen, warm climate roses only. We shall see! I don't think anyone has done a more remarkable job of breeding new purple shrubs than Tom Carruth. Both 'Midnight Blue' and 'Ebb Tide' are astonishingly beautiful. I have done some of my own work using both of these in breeding, and happily, both set seed and both can pass on these rich colors fairly often. The tendency is to breed paler mauves and dark Beetroot crimsons (which is fine by me) but good solid purples can be had as well. This is one of several seedlings selected from 50-08 so far and I sense there will be more. It shows signs of being very fast with reblooming, a trait it would have picked up from 'Dragon's Blood' I expect. And yes, it has a strong fragrance. Just FYI, this is one of the other F2 'Basye's Amphidiploid' hybrids I am working with. Here, you get a bit of an impression of how the foliage looks. These hybrids have especially spectacular Fall foliage color as well, a trait that I hope follows their progeny. 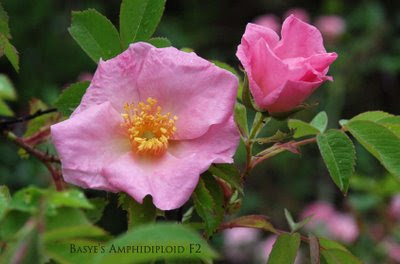 Many years ago someone sent me a few open pollinated seeds from Dr. Robert Basye's 'Basye's Amphidiploid', from which I obtained three seedlings. Two are large Spring-blooming shrubs with terrific vigor and complete immunity to disease. (the larger of these two is pictured above) The third is a short plant to 24" tall and blooms on and off all through the growing season. It too is immune to disease, but is a rather runty plant that lacks vigor. I have used their pollen occaionally on a few things here and there but rarely with any concentrated effort. This year I am making a bigger effort, since they probably have the ability to further the goal of disease proof roses of the future. I am assuming these seedlings are tetraploids and so I am using L83 and 'Basye's Blueberry' on them. When my 'Commander Gillette' blooms in a week or so, I will use its pollen as well. What follows is a bit long, but well worth the read, in my opinion. Dr. Basye specifically mentioned 'Commander Gillette' in reference to working with the Amphidiploid with the goal of Blackspot immunity in mind. The following is a quote from an article written by Dr. Basye in the 1980's. "May I outline just one plan of attack which I would consider if I were that young rose breeder? I would consider starting with a nucleus of three tetraploids: 'Commander Gillette, and the two amphidiploids, 67-305 and R. kordesii. 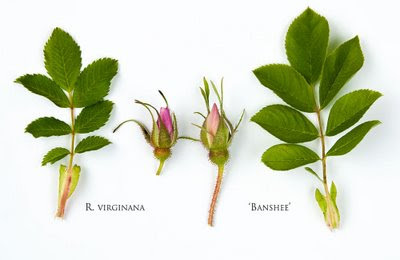 These three stud roses carry genes of the four species carolina, rugosa, abyssinica and wichuraiana, all of which are highly resistant to Blackspot. And 'Commander Gillette' has the potential of removing the thorns." "We would begin by crossing the two amphidiploids and growing a population of F1 seedlings. We would expect no great variation here in Blackspot resistance, but if there should be, let us select the best ones for selfing. In each of the resulting F2 generations of selfs we have a segregation of characters and thus a better chance of variation in Blackspot resistance. Again we select from each F2 the plants with the highest resistance. Let A designate this final group of plants of highest resistance. We would hope that their resistance equals or excels that of the two amphidiploids. In any case, we now have plants that carry genes of rugosa, abyssinica and wichuraiana. " "It remains to introduce the fourth species, R. carolina, and take the first step in the thorn problem. 'Commander Gillette' is ideally equipped for this. I mentioned in a 1985 article that the cross 67-305 X 'Commander Gillette' produced a rose, 77-361, which was free of thorns and bristles and had perfectly smooth midribs of the leaves. Recently, I repeated this cross and confirmed this possibility. But before making the cross Ai X 'Commander Gillette', where Ai denotes a member of the group A, we first make a cosmetic change in 'Commander Gillette'." " 'Commander Gillette' itself is free of thorns and bristles and has smooth midribs. Among the selfs, however, the bristles will often appear; also a rare thorn or a slight roughness on the midribs. Those recessives are easily bred out by several successive selfings. The criterion for success in such a self is that one further selfing produces a population completely free of the undesirables. One reason I have not done this before in my other breeding work is that it can lead to the loss of other recessives that are desirable. For example, 'Commander Gillette' contains a latent gene for recurrency which might be lost. I nevertheless recommend the cosmetic change for the labor saving dividends it will pay down the road - not a small item." "We return now to the crosses of the type Ai X 'Commander Gillette' where Ai denotes a member of the group A, and 'Commander Gillette' has been subjected to the cosmetic change described. A small percentage of the seedlings of this cross should be free of thorns, bristles and roughness on the midribs. Several successive selfings of each of these should produce one or more plants homozygous with respect to each of the three traits. We repeat this routine for each member of group A. All the roses so obtained form a group B. Our final group G comes from selecting from B the plants with outstanding resistance to Blackspot." "To further reduce the labor of the operation just described, it might be best to use the reverse crosses, 'Commander Gillette' X Ai, and mix the pollens of Ai." "Of the group G we can that each rose it it has high resistance to Blackspot, is homozygous with respect to freedom from thorns, bristles and roughness of the midribs, and, last but not least, carries genes of four of nature's noblest roses." Since it appears that my F2 seedlings from the Amphidiploid already have superior resistance (immunity?) to Blackspot. I am going to go ahead and pollinate all three with L83, rather than R. kordesii, since L83 is essentially a derivitive from R. kordesii with superior disease resistance and improved Winter hardiness. While this does not follow the Basye plan exactly, it does employ some of the same materials. As I say, when 'Commander Gilette' blooms in another week or so, I will include it in the crosses I make, bearing in mind Dr. Basye's outline for obtaining a superior race of disease resistant roses. If I can obtain germplasm that is capable of furthering the goal of Blackspot immunity in roses, I will be more than pleased. Its well past time we had a group of roses that could be grown without "life support" and which have better architecture and Winter hardiness, making them better shrubs for integration into a garden landscape. Final note: I will make pollen of my Amphidiploid F2 seedlings available to anyone (in North America) who wants to experiment with them. I was emasculating a few of the early blooms on my R. virginiana this morning and was taking note of the glandular buds and their shape and arrangement on the stems. Then it occurred to me, I have seen this somewhere else before. I picked a leaf and a bud and took it over to where 'Banshee' is located and compared the two roses. 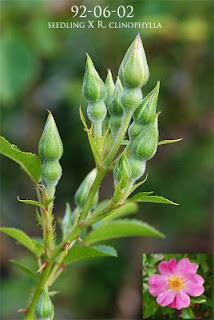 The photo above illustrates the remarkable similarity of the two roses both in foliage and the character of the flower buds. I wonder if there's any connection? There has been a lot of speculation about the origin of 'Banshee', with some references suggesting it was originally found in the prairies of Canada. Just something to ponder. I thought some of you might find the similarities between the two interesting. Oh, and in case you are interested in R. virginiana as a breeder, its a tetraploid. A big part of what I do involves experimentation; trying unlikely combinations and testing proprietary seedlings to see what they can do. Often, this also involves dredging up very old cultivars to throw into the mix. Today's post is a creature that covers pretty much all of these territories. 120-06-02 = 174-02-17 X "Grandma's Hat". The seed parent is discussed here in a previous post. 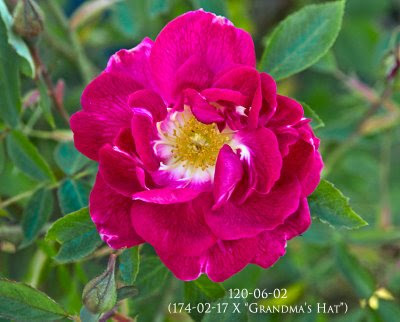 This cross was done to do several things: 1) determine what qualities the seed parent was capable of passing on, 2) to see how two extremely different roses would behave when mated, and 3) to determine if any of the health aspects of "Grandma's Hat" could be transmitted to offspring. "Grandma's Hat" is an old Bourbon/Hybrid Perpetual that was rediscovered a number of years ago, and much speculation exists over its true identity. For the most part we can only make guesses. Whatever its true identity, it is a superb rose that in many climates is one of the healthiest of repeat blooming Old Garden Roses one could wish to grow. It repeats generously, has good vigor and an outstanding fragrance. Whats not to like?! 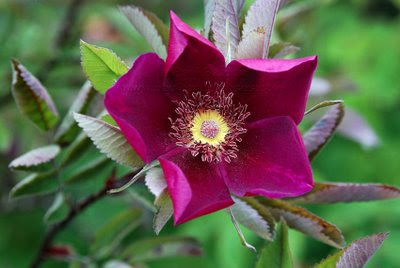 The seed parent is a cross of a miniature and the Bracteata hybrid 'Out of Yesteryear'. I have not used it a lot in breeding till 2006 when I decided it was time to explore its qualities more aggressively. I got three seedlings from it with "Grandma's Hat" as the pollen parent, and the seedling pictured here interests me a great deal. The color is richer than the photo suggests, being deeper and more of a true crimson than pink. The plant has good vigor and best of all, it is not getting any Blackspot (or Mildew) in the test garden, even with another seedling towering over it, raining down Blackspot spores. It also has an appreciable "old rose" fragrance. I am now testing it as a pollen parent with some of the better disease free roses I grow, like the Robert Basye hybrids. I made a cross circa 2002 (record of date of this cross was lost) of a yellow miniature called 'Penny Ante' X 'William Baffin'. 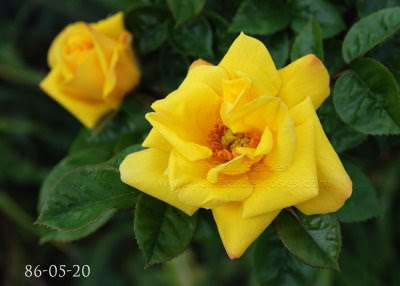 The idea was to get some yellow into Winter hardy shrubs roses, and hopefully some of 'William Baffin's disease resistance as well. In retrospect I think I could have chosen a better yellow, but you use what you have at any given time. This is the only seedling I got that had the large, arching shrub habit I wanted and the yellow coloring. These fade to white in a few days, but when fresh these are a beautiful clear Canary yellow. I have not used this seedling to further my goals, since it has less than ideal Blackspot resistance, but it appears quite hardy, with no freeze damage ever. If anyone reading this blog wants pollen from this to experiment with, just post a comment and I'll get some pollen ready to mail out. I'm mighty busy these days, pollinating for up to 6 hours a day, plus all the rest of my chores, so I have to be brief. I want to make a case for open pollinated seeds. Often they will be selfings and occasionally pollen will be from elsewhere in the garden, delivered by Bees, etc. While it can be true that you can get loss of vigor and the appearance of undesirable recessive traits appearing in OP (open pollinated) seedlings, occasionally you get something of merit as well. Case in point: 'Oshun', pictured here. (Click to see a larger version) This is an OP seedling from 'Abraham Darby', by David Austin. This rose is in many ways very similar to its parent, but it has a shallower bloom that tends to quarter. The fragrance is strong and Citrus-like, and blooms are often presented along the length of the long canes. All in all, well worth the bother of growing a handful of open pollinated seeds, don't you think?